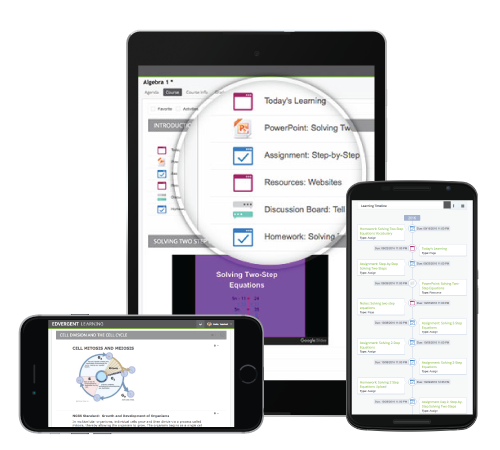 Converge is a K-12 focused Learning Management System uniquely designed to propel instruction and bring learners together. Our fully hosted solution offers an intuitive interface that gives teachers the freedom to organize and deliver content using a modular-based course design. Flexible third party content integrations ensure seamless access to the best of the web, all from one centralized learning platform. Promote anytime, anywhere learning from any device - no app required. eTechCampus Virtual Bookstore Program streamlines the entire K-12 textbook and eBook adoption process. We are your school's comprehensive solution for course materials, including print textbooks, eBooks, and digital content. A custom, one-stop online bookstore will be built for your school to meet all of your textbook needs. With five flexible purchasing options - new, used, rental, digital, and marketplace - families save time and money by purchasing course materials from one convenient location. #iTeachDigital trainers specialize in engaging the digital learner and improving the quality of teaching and learning through customized training opportunities. Make the most out of your technology investment by preparing and supporting your teachers as they learn to seamlessly integrate the latest digital resources in their classrooms. Our trainings will immerse your teachers in a digital environment where they receive hands-on, guided training by learning coaches who are experienced classroom teachers, and who have expertise in building teacher capacity through a dynamic learning experience. Teachers will leave feeling confident with renewed excitement for reaching the digital learner, and will take away applicable strategies that can be implemented the very next lesson. Edvergent's #iTeachDigital Seminars and Events immerse teachers in a digital environment where they receive guided training by learning coaches who are experienced classroom teachers, and who have expertise in building teacher capacity through a dynamic learning experience. Teachers will feel confident with renewed excitement for reaching the digital learner, and will be equipped with applicable strategies that can be implemented the very next lesson. Passionate Educators. Innovative Solutions. Dedicated Partners. Edvergent Learning is on the cutting edge of educational and course material solutions. We exist to support schools through every step of their digital transition. From valuable consultative services to expert teacher training and innovative course material solutions, our commitment to best-in-class design, delivery, and customer service are reflective in our rapid growth and loyal school partners. We invite you to experience the Edvergent Advantage. Which best describes your organization? Copyright © 2019 Edvergent Learning. All rights reserved.